Foxtel’s Play video-on-demand (VOD) service is now available on Sony’s PlayStation 3, with the content provider pledging future support for the next-generation PlayStation 4. Over 45 of Foxtel’s live channels can be watched over an active broadband connection on the PlayStation 3. The video-on-demand service gives Australia's 2 million PS3 subscribers access to Foxtel’s strong range of sports, movies, and entertainment content. Subscribers to Foxtel Play will get access to Foxtel Go, which enables streaming to select Apple and Samsung phones and tablets. Sony's gaming console lingered behind Microsoft’s Xbox 360 console, which has supported Foxtel Play since 2010. Other devices that feature the video-on-demand service include select Samsung smart TVs, Blu-ray players and home theatre devices; PCs and Macs, and select LG smart TVs. Pricing for Foxtel Play is calculated on a month-by-month basis. It is priced at $25 for one package, $35 for two, $45 for three and $50 for four packs. 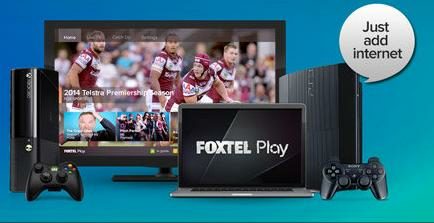 New Foxtel customers can trial the service for 14 days at no cost. Currently Foxtel is discounting the $25 Premium Movies and Drama pack — which includes TV shows Game of Thrones, Mad Men and House of cards — by offering it for $10 for per month for the first three months. Foxtel has been increasing the breadth of products it supports. The company recently launched Presto, a subsidiary video-on-demand service that leverages Foxtel's VOD movie portfolio with support for select Apple iPads, Mac computers and PCs.